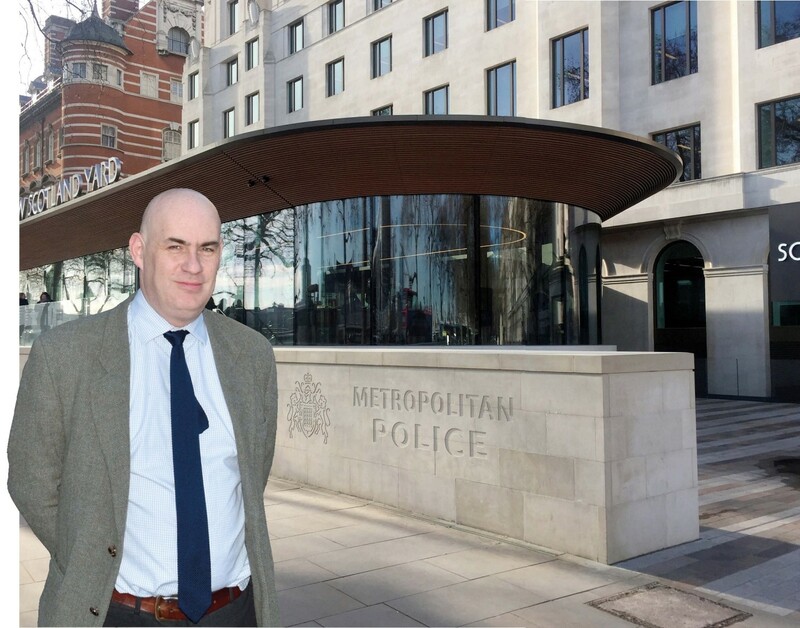 Last year there were fears the Metropolitan Police’s Art & Antiques Unit would be closed after two of its members were seconded to the Grenfell Tower fire enquiry. However, in December the team was reunited and a new boss Det Sgt Rob Upham, with 23 years’ experience in the Met, was brought in to lead the team. ATG caught up with him recently. ATG: What is the focus for the squad? Rob Upham: Fakes and looting are our number-one priorities. We have a number of active fakes investigations. They are very difficult and you obviously have to work hard to prove intent. We have close links with academia and will also approach auction houses for assistance. The high-value fakes do not emerge very often. But there are a lot at the lower end and this is still a disruption to the art market. We will look at any crime that can have a significant impact on the London art market. How important is fighting art crime? When there are art crimes they are often described as heists or a caper and almost glamorised, but the reality is very different. This is about organised criminals targeting an industry worth a lot to the UK economy that employs several thousand people. If you look at the impact, for instance recent email frauds, it closed galleries and put people out of work. How does the nature of the art and antiques crimes that you now deal with differ to your past experience? This is very different. Many of the crimes I will now look at have a historic nature. A burglary in 1985 when videos were taken: those videos are not going to surface 20 years later at a substantially greater value. We get a lot of historic allegations. The methods I would employ in my previous job are not appropriate here. Those in the trade are overwhelmingly more likely to engage in any inquiries we have. There is no great need for forced entries in the early hours of the morning. The dealers, once served notice, are aware of the obligations under the law and that they must engage. Many have long established businesses and in 99% of cases are willing to speak to us. If I go in smashing doors down then the relationship is broken and that doesn’t work for the future. This job is so interesting, like nothing I have done before. I have already learnt so much. How does the art and antiques squad get the cases you work on? The big issue is that 50% of the unit’s work was generated via foreign law enforcement agencies – largely to identify works of art that are allegedly stolen and being offered for sale at the large auction houses. Work also comes from Action Fraud [the UK’s national fraud and cyber crime reporting centre] or other units in the police. But I am trying to increase the amount of work that we generate proactively. Our best source is the industry itself – from academics to dealers telling us about things they have seen. We are now back to full strength pursuing a number of investigations. Who does the team work with? Other forces, and international agencies such as Interpol. Our team sits within the Met’s Fraud and Linked Crime Online (FALCON) command and we work with them and have access to complex fraud experts and financial investigators. But I am now trying to meet as many people in the art and antiques trade as I can. We recently went to see members of BADA, and will be meeting LAPADA, The London Museum Security Group, academics and museum curators. How will you use your experience from outside the art market? When I was on the investigations team there was a piece of legislation that was hardly ever used in relation to dealing with reluctant witnesses. It was difficult to push forward but we managed to secure the evidence of three witnesses. It is this kind of experience that I can bring. Also in relation to technology, when the Met has not managed to crack an iPhone, we can use private companies and I have experience of doing this. I tell my team: be bold. My team is very experienced but I can bring a different perspective. When you are investigating historic crimes, what are you looking for? Is the alleged stolen item the same work that has now surfaced? Can we ascertain the item is unique and indeed that same work? Where we have had allegations of looting, often the auction house or dealer has done sufficient work to show this is not the case. Often this detailed provenance has done our job for us in terms of the information of where the item has been in the past. This can be used to prove the claim cannot be substantiated. Some in the industry have been concerned the Art & Antiques Unit is under-resourced. Do you agree? The team has been at the same strength for the past 20 years. The police in London have a number of competing priorities. But we are very pleased to be up and running. Irrespective of our numbers, we have access to and work with every resource the Met has. Because we are a small unit we can be flexible and move wherever the need is. How do you deal with cases of looted artefacts? It can be frustrating dealing with historic crimes such as looting, as the criminal element is often in the past. But we are often asked about evidence of current looting in the Middle East. We are mindful of the fact there will always be enquiries which we undertake to check the background on specific items. However we have no information from current, live enquiries. Many of the looting cases have come under civil claims. For us to take enforcement action it would have to fall under the Convention in the Cultural Property (Armed Conflicts) Act. Under this law you have to identify when and where the item was looted. Sometimes in instances of false provenance it can also be the case that a fraud has been committed. There is also the more straightforward crime of handling stolen goods. Are the art and antiques trade co-operative when it comes to police investigations? We understand that reputation for the trade is everything. I am sensitive to that and I am well aware of their fears. However, I am also aware that the trade communicates freely with each other and should not be afraid to approach us in whatever way is appropriate for them. We can be discreet. We are always willing to listen and receptive to any approach and willing to act on any information they provide. Is there a case you would have loved to have been involved with? The theft of the £2m worth of rare books and manuscripts from a warehouse in Hounslow last year was very interesting. Had I been here I would have loved that case [which is now being investigated by the London crime squad]. 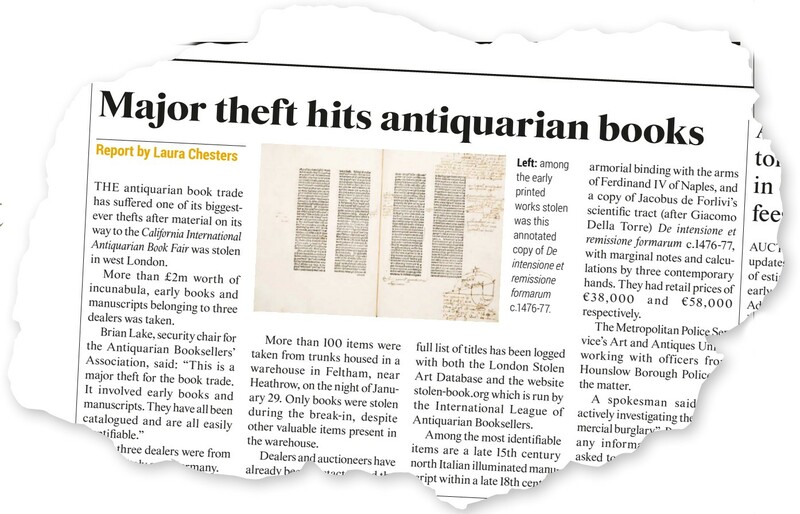 How ATG reported the theft of £2m worth of rare books and manuscripts from a warehouse in Hounslow. However, decisions on what we get involved with are resource-driven as we are a small unit. We can rely on the larger units such as the London crime squad. A crime like that would sit with them as they can provide a dedicated investigation team. It was a burglary, after all. We have to be careful we don’t get overwhelmed with cases that detract from our goal of protecting London’s art market. But in some instances I can discuss with my DI and we would look at whether we could resource an investigation. What can we expect to hear from the team in the coming months? The legislation we deal with is complex in nature and involves many enquiries. It may be a while before we get results. But, rest assured, we are actively engaged in a number of investigations. joined murder investigation team (Met’s Homicide and Serious Crime Command). Team: Rob Upham, detective sergeant, with detective constables Ray Swan, Sophie Hayes, Philip Clare and civilian analyst Chris Groarke. *The squad does not pass on data to the Art Loss Register but ALR contacts the Met when it receives reports of stolen artworks. Fraudster Aleksander Ribnikov of Feltham was caught by the Met Police’s Art & Antiques Unit after he consigned a Greek libation bowl, known as a patera, with TimeLine Auctions in Essex in November 2016. A document purported to show that Ribnikov had purchased the patera in 1987 from a man in Swansea. A detail of the Greek libation bowl which emerged at auction and led to the arrest of Aleksander Ribnikov of Feltham. The item was to be offered for auction as a 4th or 5th century BC object estimated at £80,000-100,000. However, the Art & Antiques Unit proved the provenance was fake, as the alleged seller did not exist and the document had been written in a Poundland notebook made after 2013. Ribnikov pleaded guilty to two counts of fraud by false representation at Isleworth Crown Court in September 2017.